The cornerstone of our philosophy is to provide effective massage therapy without causing unnecessary pain or the three day recovery period that is common at other practices. At our facility you won't find a "grin and bear it" mentality. You'll experience gentle techniques that effectively reduce tension and pain in a way that reconnects the mind to your body without being a "light, fluffy massage." Includes firm-pressure & gentle stretches. We blend different techniques to achieve the optimum results. Helps alleviate pain, muscle spasms, stress, inflammation & tissue damage. Breaks up trigger points and adhesions. At this facility you will not have to brace yourself through the pain of treatment. Everything is done with your body as your tissues relax and unwind. This is a perfect choice of treatment for athletes and those with injuries. Relaxing and rejuvenating Swedish massage. Massage treatments are tailored to your needs and preferences. These treatments are not deep tissue. This method of massage works with your body, melting through the layers of tension rather than forcing through it. Treatments are performed in a quiet atmosphere with soft music of your choice and natural light. Swedish massage uses five styles of long, flowing strokes to massage. The five basic strokes are effleurage (sliding or gliding), petrissage (kneading), tapotement (rhythmic tapping), friction (cross fiber) and vibration/shaking. Swedish massage has shown to be helpful in reducing pain, joint stiffness, and improving function in patients with osteoarthritis of the knee over a period of eight weeks. It has also been shown to be helpful in individuals with poor circulation. Essential oils stimulate and tone the skin while calming your nervous system. They can increase local temperature, reinforce interchanges and speed the elimination of toxins. The lotion is given time to absorb into your skin leaving it soft and supple. This special massage uses basalt stones that are heated to optimum temperature and are then used with massage strokes to provide a unique relaxing massage. 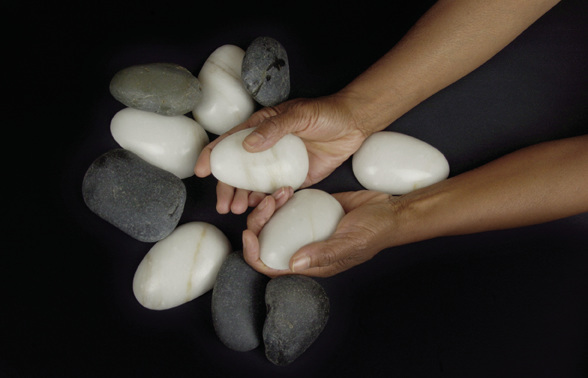 The stones help to heat and relax tight muscles before the therapist works on the area to allow deeper work more quickly. Hot stones can also be incorporated into your regular massage to increase relaxation of muscles. Hot Stone massage is not appropriate if you have diabetes, high blood pressure, heart disease, or are on medication that thins your blood. You shouldn't get a hot stone massage if you are pregnant or have a sunburn. You also may want to reconsider if you are menopausal, as it may trigger a hot flash. Fine sea salt (or sugar) is combined with essential oils and other ingredients and is used to gently exfoliate your area of choice. This treatment will leave your skin feeling soft, supple and completely touchable.